Yeah, there's no denying it. He has a devilish side. He loves to wear red, he's usually sporting a wicked grin, and he's not shy about giving poking people with a stick when the mood strikes him. Our advice? Let's just try our best to get it out of his system! 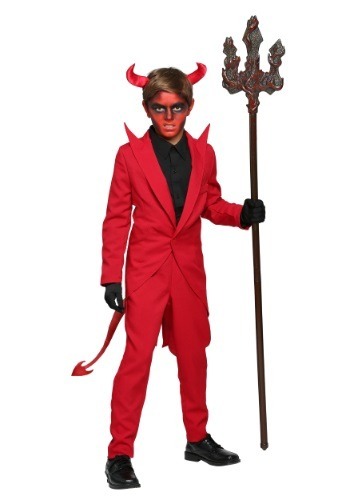 The easiest way for him to become a true devil is to go in this child Red Suit Devil costume. We're sure that once he knows what it's like to have to put on makeup everyday, wear horns, and carry around a pitchfork trident, maybe he'll be happy to embrace a lighter, happier identity after Halloween! This wicked costume is made and designed by us here at HalloweenCostumes.com. With a traditional devil inspired design, the red suit styled costume has some important style upgrades. The attached pointed tail swinging about is sure to make any child look like a hellish demon, and included headpiece will totally reinforce that idea. Extended point peak lapels on the suit jacket look downright devilish, and he can complete the look with his own black dress shirt and dress shoes. When he arms himself with a wicked weapon and some face paint (sold separately), you know he'll be ready to bring fire and brimstone! And with this suit ensemble, he won't just be bringing the heat, he'll be looking pretty dapper in 2 piece style, too. Dashing, dapper, downright fiery... now that's will be a theme that will have him saving his tricks up for Halloween night!